Katherine School of the AIr - Write A Book In A Day (WABIAD) Successes! Katherine School of the Air (KSA) is now a regular participant in the Australia-wide competition Write a Book in a Day (WABIAD). The competition raises money for the KIDS Cancer Project, currently this year they are up to $129, 000. 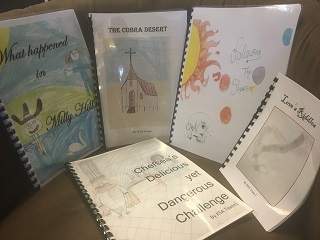 Participants have 12 hours on their chosen day to write and publish a book that will be sent out to kids’ cancer wards in hospitals around Australia. So 12 hours to write a book? That might work well enough when the writers are in one room but how do you achieve this in a distance education setting? Lyndal Carbery, a teacher at KSA, who has run the competition at the school since 2014, knows just how challenging it can seem to be, but she has developed a method that means every student, no matter their literacy level, can achieve big things on the day. Students can participate as a Primary, Middle Years or Senior Years team, and there is also an Open category for adults. There must be between 5 and 10 writers. The night before the teacher must download a set of parameters: 2 human characters, one non-human, a setting and an issue. These parameters are unique to each group. Every team in Australia has five random words they must include within their story. These parameters form the basis of the story the students will write. The key to the school’s success is the use of the school portal and a OneNote document where they do all their planning and writing. In real-time they can read each other’s chapters and leave messages of encouragement. Students also hop on and off their Interactive Distance Learning Tool throughout the day to have collaborative sessions where they read their work aloud and share ideas on how to expand the story as it develops. The teacher takes on the role of facilitator and time-keeper: it really is a day about the students taking control of their work. Lyndal is more than happy to be of any support and assistance to those teachers and DE schools wanting to give their students the opportunity to collaboratively write a book with their peers… in one day.